Sitting atop at an elevation of 733 meters above sea level, the ancient hill town of Kangra is located at the foothills of the Western Himalayas in the state of Himachal Pradesh. The town is placed on the confluence of the Benar, Majhi and Beas River and is known for its spectacular views of the Dhauladhar Mountain Range. The origin of the town dates back to 4300 BC, when the region was known as Trigata as mentioned in the ancient Hindu texts. The kingdom of Trigata was founded by the King of the Katoch Rajput Dynasty which is the oldest surviving Royal Dynasty in the World, which has also said to have fought in the great mythological wars of the Ramayana and Mahabharatha. The region fell under the subsequent control of the Mughals, Gurkha and finally was declared as a Princely state under the British. Today, the town is known for its distinctive culture and picturesque surroundings. The town lies in the larger Kangra Valley, which is located in the foothills of the Dhauladhar range of the Himalayas. This provides the town with a mild summers and chilly winters. The months between April and June are the hottest with temperatures ranging between 20 and 30 degrees Celsius. The months between July and September receive the maximum rainfall. The months from October till late February experience a pleasant and chilly winter, with minimum temperatures as low as 4-5 degrees Celsius. While most tourists prefer the higher elevated Dharamshala during the summer months, Kangra is best visited during the months from October till late-February. Due to the moderate high elevation the summers in Kangra are mild yet humid and winters are chilly yet pleasant. Being one of the oldest kingdoms of India, the town is considered a national heritage and home to the oldest surviving Royal Dynasty in the World. It was a place known for its rich temples and palaces, most of which were destroyed after an earthquake in 1905. Nevertheless, the town boasts of immensely friendly and helpful people and picturesque views of the entire valley and surrounding mountains. Kangra Fort, Kangra Valley, Dhauladhar Mountains, Jwalaji Temple, Chamunda Devi Temple, Baijnath Temples and Marsoor Temples etc. 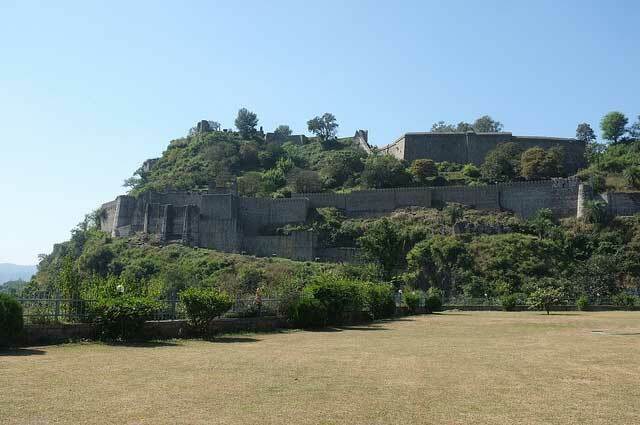 are the few must be seen attractions in Kangra. Getting in the town should not be a problem for any tourists as it is well connected via roads with the surroundings hill stations. Buses are available from the major cities like Delhi, Chandigarh and Shimla and transverse through some well maintained roads. The town has a narrow gauge railway station that can be reached via stations in Pathankot and Chakki Benk. The Kangra-Dharamshala airport is also well connected with the various international and few domestic airports in India. Being an important tourist district, accommodation is not a major hassle in Kangra. Most of the tourist crowd heads towards the more popular Dharamshala during the tourist season and it is recommended to book your stay in Dharamshala due to the wider availability of options. The small town can be covered in 1-2 days on foot or by taking taxi rickshaws.